Lahti has implemented new solutions to make cycling an easier option. Cycling campaigns, a public bicycle borrowing system and measures to replace the current bus fleet with electric buses all support the creation of light traffic oriented city. 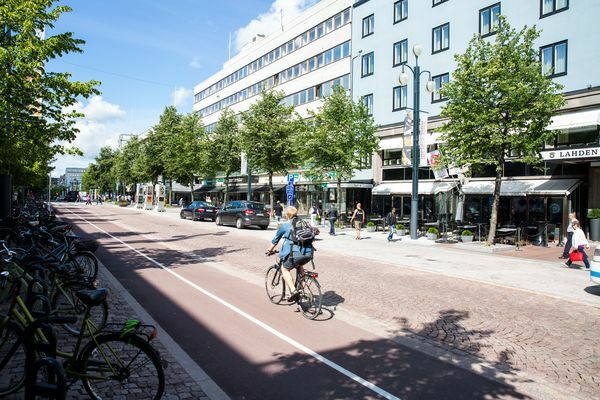 In the near future Lahti aims to double the amount of cycling in the city. To promote cycling and walking, the city has built and upgraded traffic-free cycling and pedestrian routes for pleasant and safe travel environments. A two-way cycle path serves in the city centre, offering convenient bicycle parking areas along the cycle path. Finland’s’ first two-tier bicycle racks for public bicycle parking were built next to the bicycle tunnel of the Travel Centre. Bicycle parking facilities are conveniently situated around the city and represent pure urban design. Winter maintenance practices and quality criteria have been defined for cycle tracks. In the future, cycling highways will be included in the city plan, which means rapid connections from residential areas to the city centre. In 2016, Lahti’s Transport Planning Unit received recognition for its work to promote walking and cycling, when it was granted an award by the national Fit for Life Programme. Lahti is a cycling city. The number of journeys made by bike has increased six-fold compared to the 1990s. 51% of all other trips are made by passenger cars, 25% by foot and roughly 6% by public transportation.